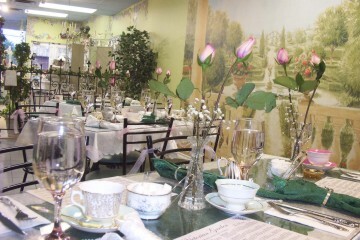 Looking for the perfect setting for your next special occasion? “High Tea in the Garden”, served on a tiered presentation platter featuring a fresh baked scone, crème, fruit jam, assorted finger sandwiches and petite desserts. Accompanying your platter will be a lovely individual pot of tea that may be chosen from our selection of 35 different loose-leaf varieties. Children will receive a delightful smaller version of our specialty and can substitute their tea for a pot of gourmet hot chocolate. Please inquire as to other menu options. Starting price per person : $ 29.99 plus taxes and 15% gratuity. A gift table may be provided, please advise at time of booking. You may bring a cake (a plating charge will apply). 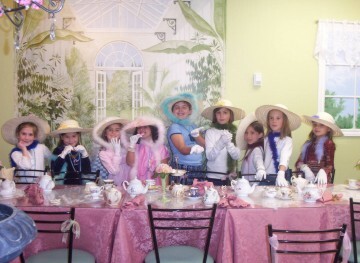 We only use the finest china and encourage all of our guests to wear their own fancy dresses. 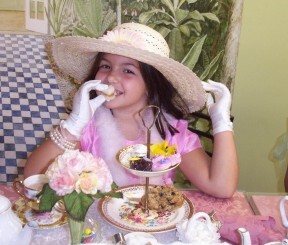 Don’t forget their little dollies or teddy bears, and of course….. their best manners. Our parties last for one and a half hours. (we kindly ask for 1 adult per 3 children to be present during the party). You may bring a cake and we will gladly serve it. Please enquire for more details. Price per child : $24.95, plus taxes and 15% gratuity. A $50.00 deposit is required at time of reservation.